Looks like the Aluminum sheared right off!!! Holycrap. Jeez- I thought the alu steerers were better than the carbon ones! 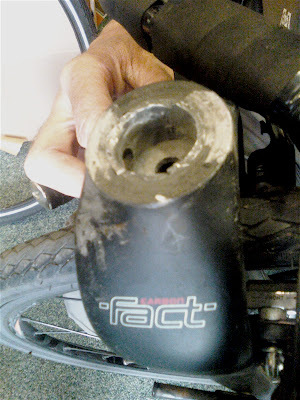 Annnd...there is a recall on Felt cyclocross bikes equipped with alu steer tubes (see 'news' at bicycle paper.com)...is this a trend? That's more like busted alloy. 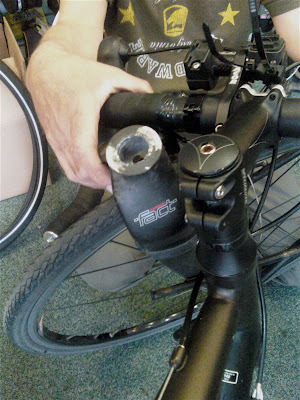 The crown and steerer are alloy and the legs are carbon (below the brake bosses). Scary, though. Not covered by warranty even though this is quite clearly a design flaw. Lots of Specialized Langsters have also snapped the same way! What year was the Tricross model in the pictures? I am second owner of a 2008 Tricross Sport.